It is a fully licensed Medical Marijuana Delivery service provider, helping patients meet their medical needs. They offer top grade medical cannabis and edibles and make them available through their discreet professional delivery drivers. MedCan boosts of an online application page on their website that all interested patients can use to register for its services. You can give them a call to guide you through the registration process. 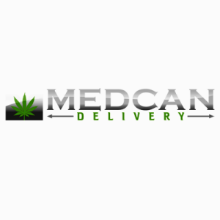 Free delivery to all registered patients of MedCan is guaranteed with a minimum order of $90.00. They offer a discount of 10% for all first time patients on their total order. Depending on your preference, Donations can be made with cash, debit or credit card. MedCan Delivery is an organized, not-for-profit Co-operative of qualified patients in Washington State operating within strict compliance of RCW 69.51A. Serving King and Snohomish Counties. Your services are top notch! I placed an order and was delivered under an hour…that is fast enough for me. Job well done guys…you just made my life a lot simpler!